I love peanut butter, and I’ve never purchased tahini in my life. In fact, I don’t really like the taste of tahini. Peanut butter gives hummus a nuttier flavor, and has been available in every place I’ve lived around the world. Tahini hasn’t. Plus, having a jar of peanut butter around is better than having tahini. You can’t make tahini sandwiches, or eat a spoonful or two of tahini when you’re out of money, and the only other food you have left is bread. Peanut butter can sustain you until your next paycheck. I use dry chickpeas. They’re cheaper than canned, but take longer to prepare. Let dry chickpeas soak overnight, up to 24 hours before using. If you let them sit longer than a day, they start to smell pretty bad. And make sure to wash and rinse the chickpeas thoroughly before soaking them. After soaking chickpeas, you need to boil them for about an hour. Don’t forget to boil them. I made that mistake once. Tasted terrible. But, I assure you, what you read online about eating raw chickpeas isn’t true. I'm still alive. I didn’t die. It’s best if you have a blender to make peanut butter hummus. Borrow one if you need to. If you don’t have electricity, or access to a blender, find something with which you can mash it all together. If you have a blender, simply toss everything in at once. Set aside some broth from boiling the chickpeas in case you need to add more liquid to the mix. I usually put the peanut butter, chopped garlic and onion, spices, lemon juice, and olive oil in first, followed by the chickpeas. Make sure you don’t add too much broth at first, otherwise your hummus will turn out like a smoothie. Unless you plan to drink it, that’s just gross. Blend it all up, adding more oil, broth, and seasonings for desired consistency and taste. My favorite part about making peanut butter hummus is eating it straight from the blender, as my guests all wait in the other room for a taste. I don’t let anything go to waste. Use a spoon, spatula, or chunk of bread to scrap every bit of it out. After getting your fill, garnish with a bit of seasoning, a lot more olive oil, and serve it to your guests. 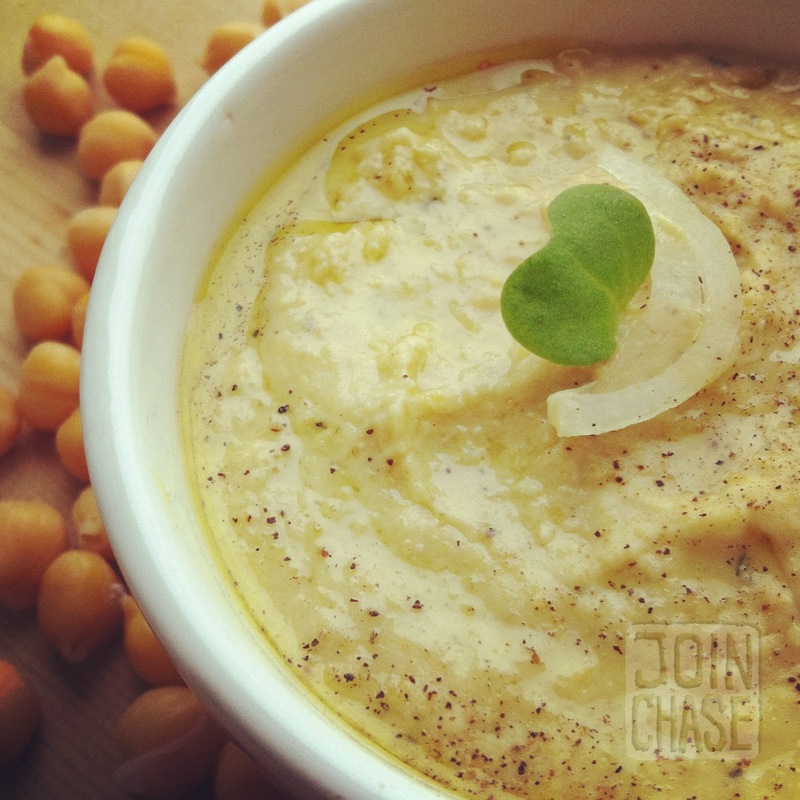 Peanut butter hummus goes well with just about anything regular hummus would. Vegetables, crackers, various types of bread, rice and pasta are my preferred pairings. Keep it refrigerated and consume within two to three days. If it gets a little dry, add more olive oil and stir.